Tim Lewis’ kinetic sculptures stem from an early fascination with strange objects and raise questions about the boundaries that lie between nature and fabrication. Dazed Digital visited him in his studio in the run-up to the Kinetica Art Fair, which opens this week at the Kinetica Museum in London. He gave us a delightful, and rare, glimpse into his world, where chairs walk, birds nest in shoes and man-animal-machine hybrids are brought to life. Dazed Digital: Why do you find the boundaries between nature and fabrication so fascinating? Tim Lewis: It’s more that I don’t see any boundary. This sounds like a very anti-environmental viewpoint, but in fact it’s the complete opposite. Most animals fabricate things in a small way and I don’t think we’re that different. When you look outside at what humans have done, it often looks like a big ants nest. Whatever we do is natural, it may not be good, but you have to admit that we’re just animals. DD: Have you had any real-life experiences, or dreams, that have had a significant influence on your art? Tim Lewis: There’s one piece, which I’m showing at the Kinetica Art Fair, called 'Flight', and it first existed in a really grim dream. My house was falling to bits and gunk was coming out of the taps and the light bulbs. There was an awful noise of flapping and when I looked at the light bulbs, they became birds. I enjoy the feeling of something being not quite right, and the strangeness of something that isn’t quite in your world. The dream was the very beginning of the idea. I only had to buy the materials and put them together in the right shape after that. There’s a real subconscious element to my work. Sometimes I wonder why I work so much on birds. DD: Why do you think birds appear again and again in your work? Tim Lewis:I don’t like birds and I’m not interested in birds but yet everything seems to come out as birds. Perhaps it’s just the shape of them, the mattness of the feathers, the strangeness of them. Perhaps it is something I’m subconsciously attracted to for some reason. Interestingly, they’re never birds in flight, they’re always walking, or hanging from something or have wheels. DD: Is there a sense that these pieces of work take on a life of their own after you create them? Tim Lewis:With the more recent pieces, yes, it’s definitely becoming the driving force behind my current ambitions. My ultimate ambition is to make something that has its own independence. It wouldn’t necessarily be sentient, but it would have its own existence. 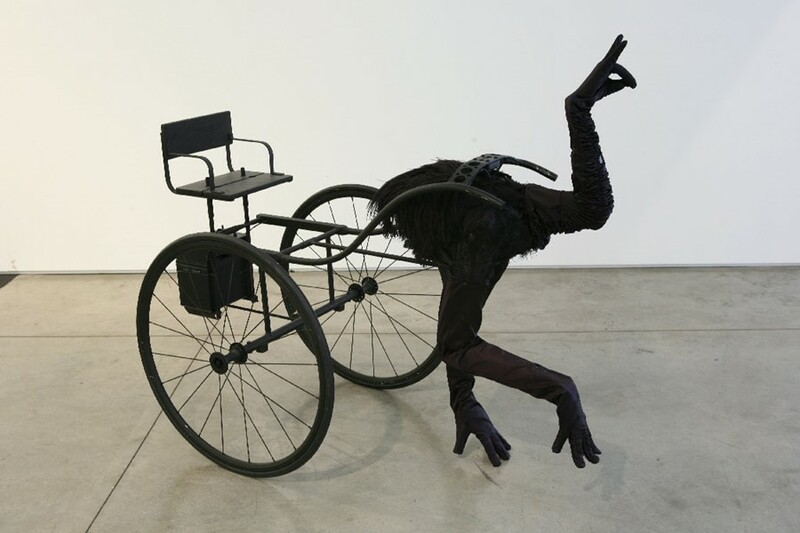 I noticed that when people played with the walking ostrich chair at the last Kinetica Art Fair, they played with it very carefully; they were very sympathetic and respectful towards it. I think there’s definitely the willingness to believe that things have their own rights. I love the idea of being able to make, as art, things that become more than just an object. DD: Why are you attracted to the medium of kinetic art? Is there a philosophical element to it? Tim Lewis:I think that when you first approach a piece of art, and you imagine it and draw it, there’s a sense that it will always remain somewhat in your imagination. Its only when you take the 2D object and re-work it into the physical 3D world that it becomes somewhat more real. It no longer just exists in your eyes and mind, but instead has to react with the floors and walls around it in the physical world. For me, kinetic art highlights the importance of bringing both inventions and imagination into a physical existence.